Game reviewed on the PS4 with a copy provided by THQ Nordic. Developer Piranha Bytes has made a history of creating games that were considered above all else as polarizing. While the Gothic and Risen franchises were not able to find large scale success due to their buggy or lacking nature, it did not stop them from amassing a loyal cult following. 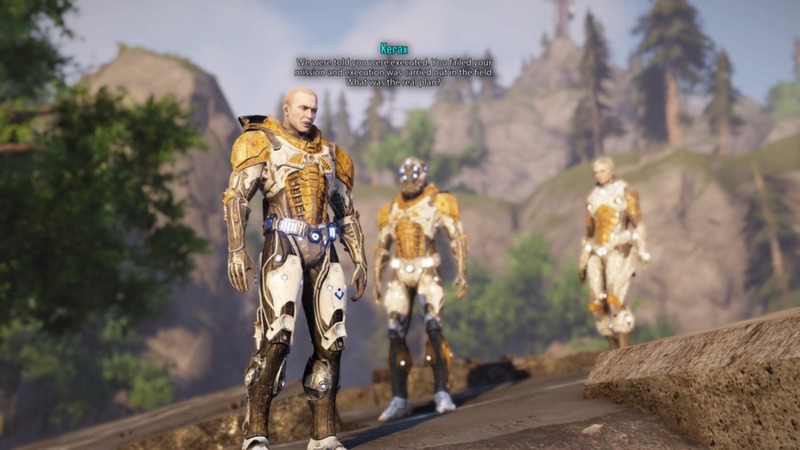 The release of Elex however represents an opportunity to begin a new franchise with a clean slate that is bogged down by that past reputation. The most fitting place to begin would be the graphics. Right out of the gate, I was met with a very nicely stylized cut scene going over the initial plot points. After which the in game engine kicked in with a scene of the protagonist climbing out of his ships crashed wreckage and into a dialogue sequence. The details on both NPCs armor were very well designed and technically executed. It didn’t take long however for the blemishes to start to surface. I shrugged it off initially but the door to the ship that was being exited had very poor texture work, an occurrence that would pop up often. Moving forward in my adventure I noticed that the enemies I was coming across, like the NPCs, were nicely detailed but inanimate assets like cabinets, rocks and walls were not given the same level of attention. Here was this massive sprawling world just begging to be explored and at quick glance, it had a varied colour palette, a clear use of verticality and different landscapes to change up the feel of my travels. However, as welcoming as it appeared, I was looking at the forest for the trees and there was no denying that those colours used were often washed out and that not all of the landscapes were done very well overall. The snow covered northern regions specifically suffered from poor texture work that would most likely have been considered unacceptable to even the previous generation of consoles. While other zones did fair somewhat better, there are examples everywhere from sands in the desert to rocks in the forest that could have used a bit more love. On that note, another missed opportunity would have to be the animations as a whole. At no point did they seem to flow smoothly. There are examples everywhere to show that this game could have used a bit more time to be properly polished. 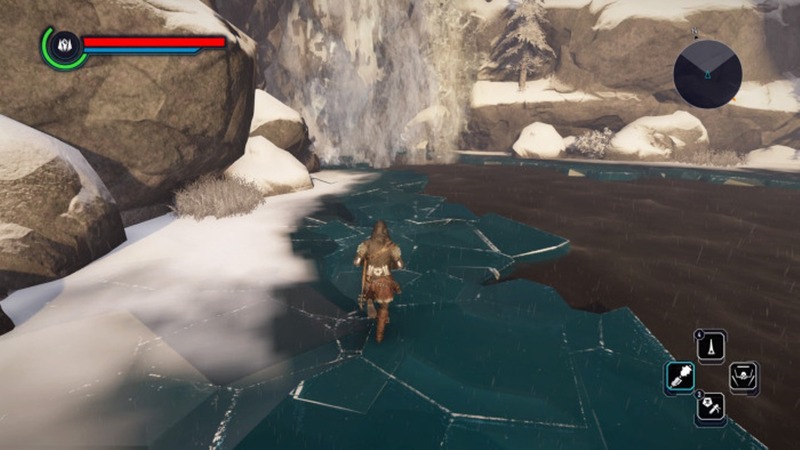 When you initiate a run the transition will often appear as a choppy jolt, when jumping off of a high platform your avatar will just stiffly descend with no sign of velocity and if you are just a little too far from a cliff face that you are trying to climb don’t worry the game will adjust and magnetize you to it. Ignoring the environments constant tendency to clip into your character the most common occurrence that will annoy you is the transition from well lit to dark areas and vice versa. This effect is abrupt and will often leave you vulnerable to what lies beyond since your screen won’t prove visual queue until the very last possible second. Despite all of these complaints, I still found the game easy to look at but only if I refrained from inspecting it closely and nit picking the missteps. This is a situation of having to force oneself to focus on the sum of its parts. The graphics as a whole really were a mixed bag. Shifting over to sound design, there isn’t a lot I can say about the music in this title. It is fitting and while not inherently bad it doesn’t do very much to differentiate itself from other similar fantasy games. Thankfully, it does understand balance and knows when to fade out and allow the ambiance of the world to take lead. It pains me to say but when it comes to the voice acting I think that the casting for many of the characters was spot on but that those actors deliveries were unfortunately robotic and devoid of any sort of emotional response. As a result many of the conversations didn’t feel like they were flowing genuinely but rather as a series of stoic phrases cropped together. While I know I have already talked about the animations previously, I also find it difficult to believe that there was even an attempt made to match up the lip syncing. It’s not game breaking but it’s also difficult to ignore as there is so much dialogue in the game and it is all voiced, which should be a praised aspect of the game. When it comes to the story, it would be difficult to properly sum it up in a short time. After all, we are talking about a game that possesses trophies to do over 300 quests and spend over 80 hours in game respectively. You are of course provided with initial motivations before being sent out to shape the journey as you see fit. 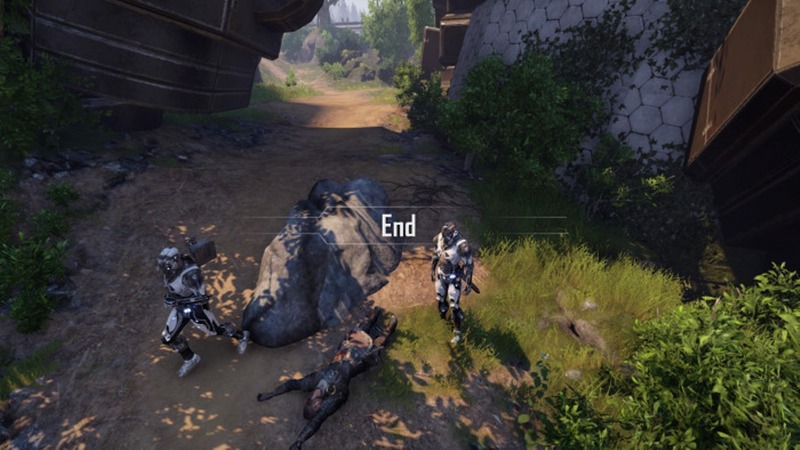 As a former member of the Albs, a faction of warriors who have infused themselves with the namesake Elex in order to augment their abilities and remove emotion from logic when it combat scenarios, you have failed an important mission you were tasked with and awaken after having been left for dead and from suffering Elex withdrawal. 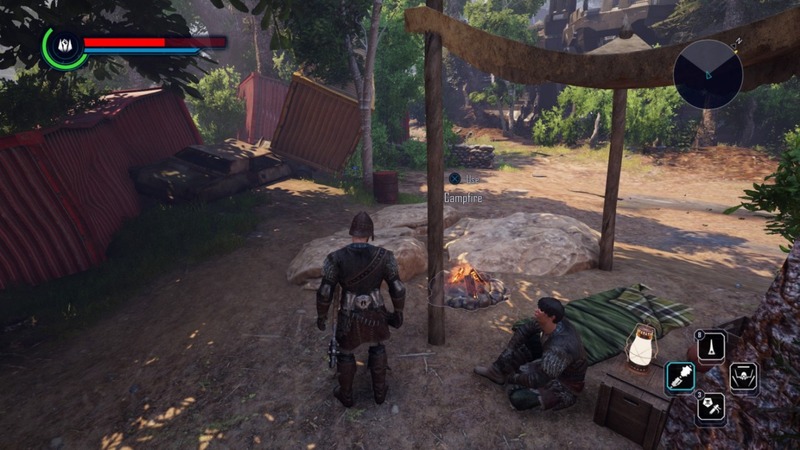 Elex itself didn’t always exist on Magalan. It was discovered in the wake of the destruction brought on by a meteor crash that altered the way of life for all of the world’s inhabitants. It possesses the capability to grant magical abilities and is also used as a fuel for new forms of technology. Now three factions have emerged that have drastically different views on how it should be utilized in the rebuilding of society. The Berserkers have forbidden it entirely and will remind you of that if you even attempt to open your map while in their refuge. The Outlaws have created an almost ‘Mad Max’ type of existence in the desert where survival of the fittest dictated how one utilizes it. Finally the Clerics, who have wholly embraced it to further their technological advancement as can be seen in their power armors and energy weapons. It is now up to you to survive and decide between friend and foe while finding a new place in the world. Let’s be honest, if you are playing this game it is probably for the world itself. It is massive in scope and since it is completely open you can venture off in whatever direction you feel like in order to quest. However, know that there is no sense of scaling to be found so everywhere you go will be wrought with enemies you can defeat as well as some that will destroy you seemly with as little as eye contact. Caution is necessary but you are also granted a few aids in the form of fast travel and a hover pack that you can and will need to utilize in order to get out of harm’s way. As gameplay does not stop while in your inventory, know that there is no form of carrying capacity or weight so that you can leave your management time relegated to when you are back in a town. What would have really helped would have been an option to sell all junk at shops, as hours of exploration could result in large quantities of items clogging up your menus when you finally get around to it. You may have noticed that I have not mentioned combat in the game yet. That is probably because the best that I can say about it is that it is functional, simply serving as a means of completing tasks that cannot be done otherwise or reaching points of interest that are road blocked by creatures that crave a taste of your blood. Ranged weapons are particularly inaccurate, feeling floaty and unreliable so as to almost force me to limit myself to melee combat, admittedly my preference in most games anyway. Also there is a combo system for chaining light and heavy attacks while charging a special bar in order to unleash a powerful strike but with stamina reserves being fairly low you will often want to keep some of those resources available for a dodge or parry that could extend your existence by a few seconds. I didn’t accidently say seconds, this game will mess you up. There is no beating around the bush, this game is punishing. That won’t come as a surprise to fans of the developers previous titles but there is no point in which you won’t have to work for every shred of progression you make. Trial and error will become an unyielding necessity to your experience as you slowly chip away at objectives. It can honestly be hours before you find a new weapon that is a slight upgrade or gain enough experience to level and allot a small number of very vital attribute points. If you can make it far enough to find your first companion you will almost immediately feel a slight reprieve from the dangers of the world even though death will still loom around every corner. Accomplishments will feel incredibly rewarding but you may never get to experience them if you don’t juggle back and forth between smaller more manageable objectives. Effort stacks up and there is no one path to success. Beyond that I have to take a moment to mention the bugs in this game as they will often over shadow all of the good and be a driving force in deciding if someone sticks with the title. There were instances where I would not be able to loot a chest, my map system would open to be blank and even find the UI missing entirely after loading a save file. Sure another quick reload would resolve the issues but they were so frequent and that just shouldn’t happen at this point. Neither should things like spelling mistakes or inaccuracies in the subtitles but they do exist here and will cause many people to raise an eyebrow and unfortunately maybe even put down their controllers. Ultimately, like previous entries from Piranha Bytes, this game is not for everyone. 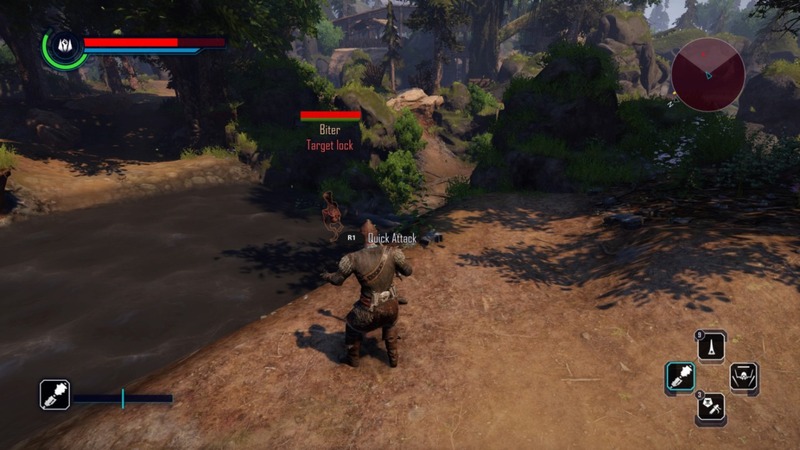 There is absolutely an audience for Elex but that would be amongst those that are more patient and can look past the flaws of a game in order to find its charms. Even still it would not be difficult to suggest that anyone interested wait for at least one substantial price drop or news of substantial patch work to smooth out the issues before making the dive. As someone who has not been a fan previously, I am constantly drawn back by the allure of exploring a world in a game that is flawed but still enjoyable, so that must count for something.